Then are the years that my own father or brother were overseas. I teared up at the fact that they were there serving, rather than being home to carry the flag & march in the parades. But, I understood the purpose. To this day, I still tear up when I see old glory & the color guard. We all pray for the day where there is no more war. But the reality is, there will always be a need for protectors of our freedoms. Those protectors are your very neighbors, moms, dads, brothers, sisters, aunts, uncles, grandfathers, friends, & complete strangers. They make the choice to join the United States Military to keep us safe from harm. Sometimes, it doesn’t go as planned, but you can bet they are still fighting the good fight & are there to put the pieces back together. They make sacrifices. And for that, Memorial Day is more that just a “day to BBQ.” It’s a Time for Remembrance. At Creative Surfaces, we are truly blessed to have such defenders working for us. 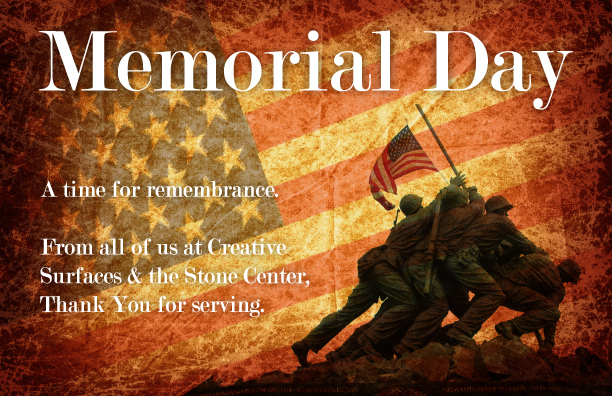 Thank you to those that served, or are currently serving, for your dedicated service. We appreciate everything you do. Please remember these soldiers today & every day. Pay some respect. Stand at attention when the flag goes by. After all, the flag flies for your freedom & for those lost fighting for it. Remember that. May GOD Bless you all.